Ring...my bell. Ok, so not technically an ‘r’ but, the sound of a ringing bell does say Christmas. We have lots of bells to ring here. From simplistic plain bells to bells adorned with military figures or an ink stand complete with bell, you'll be able to call people to the table with a beautiful tinkle by choosing one of our jingle bells. Scent Bottles...there is something romantic about having your dressing table arranged with eye catching and beautiful things. 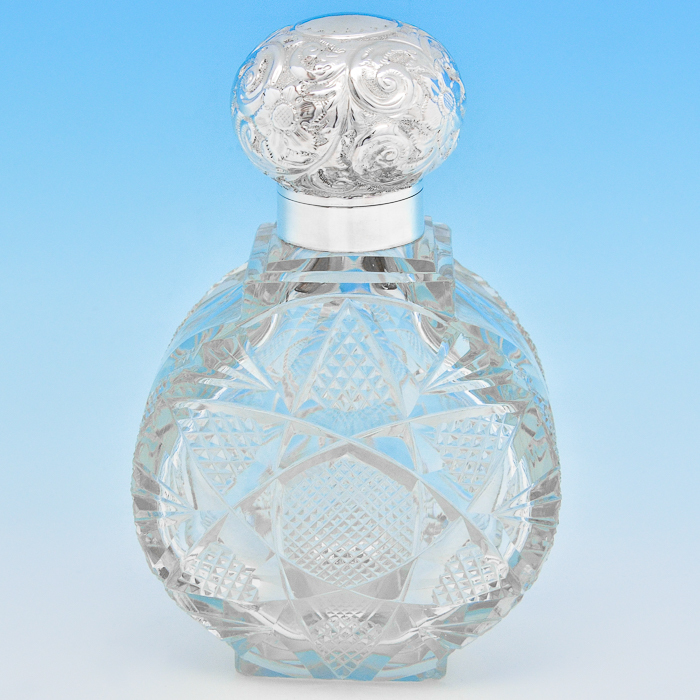 By decanting a favourite scent into an exquisite bottle, it instantly elevates it to something even more special. A silver topped bottle of beautifully cut glass, filled with their prefered eau de cologne, will be appreciated each time they splash it on. Tantalus...is effectively a locked cage to keep all your favourite, special tipples in. 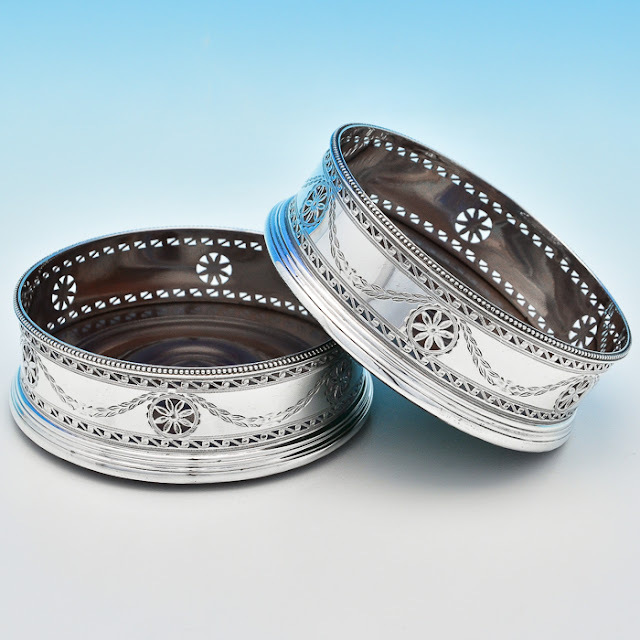 The tantalus can be found in silver plate, sterling silver or wood and silver, and we have a fine selection in every style. Nowadays it is unlikely we keep our drink under lock and key, away from the staff, but such handsome stylings means these frames and their beautifully cut glass bottles are still desirable today. Utensils...my goodness there is a vast array of utensils available in silver. Whether it is serving pieces or dishes we have an unrivalled selection. Basting spoons, ladles,asparagus tongs,sugar tongs,marrow scoops, stilton scoops, grape shears to name but a few. 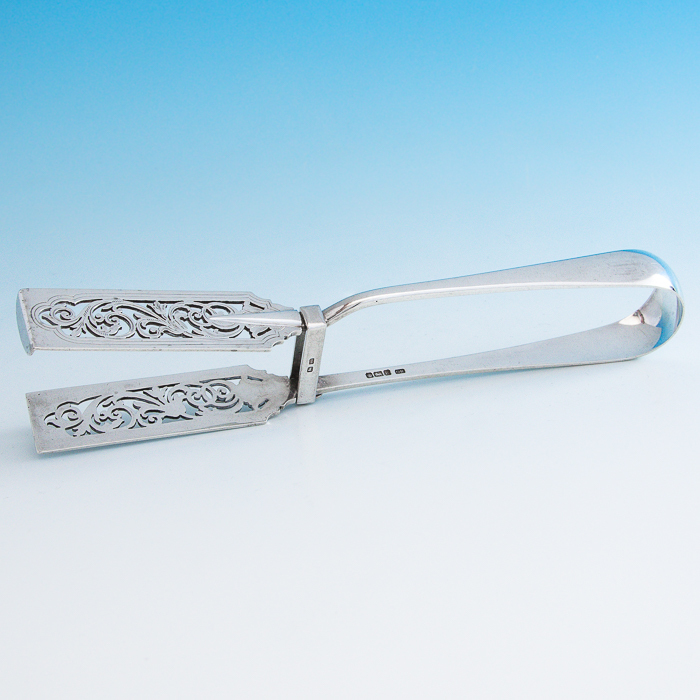 Basically, any food they could devise a specialist tool for chances are it was made in silver. These clever items make great gifts and quite unique, meaning you're unlikely to find that someone else has come up with your idea. bud vases for just a single flower or a more elaborate trumpet epergne with a central vase just crying for a loved ones favourite flowers. A few holly berries or some lovely red flowers and Christmas is here. to treat to a stylish and yet practical present. Not only good looking but, equally important, it will protect your fine furniture too. You may only want a single wooden based silver coaster with a recent hallmark, or perhaps, push the boat out and select a set of four all silver Georgian ones, to really impress. Xcited.... for Christmas... ok now, as we don’t have in stock a silver xylophone at the moment I am struggling to be able suggest something here, but, we do have a lovely bugle should you know someone who would like to blow their own horn. And forget about those pipers piping, how about a sterling silver flute presented in its original box, so someone can be a flautist flauting?! Yacht...I am not suggesting we have a silver yacht down here but we do have lots of items that would look great on board,for those lucky enough to have such a thing. How about a ship’s decanter? These wide based jugs were also known as Rodneys, named in honour of Admiral Lord Rodney’s naval victories. Or, you could opt for a tea set so you can add a splash of glamour to high tea on the high seas. Z...is for zoo animals. We can offer you an elephant or a tiger. Why not pick up a penguin for someone you love. We have lions and tigers and bears, oh my. I thought to end, I would throw in that little Wizard of Oz reference because it always crops up on telly over the season. So, that is it from me for another year. I wish everyone a Merry Christmas and hope you all enjoy the festive season.